Have you ever heard the real estate slang “buying a listing”? No, we’re not referring to the actual act of purchasing a home. 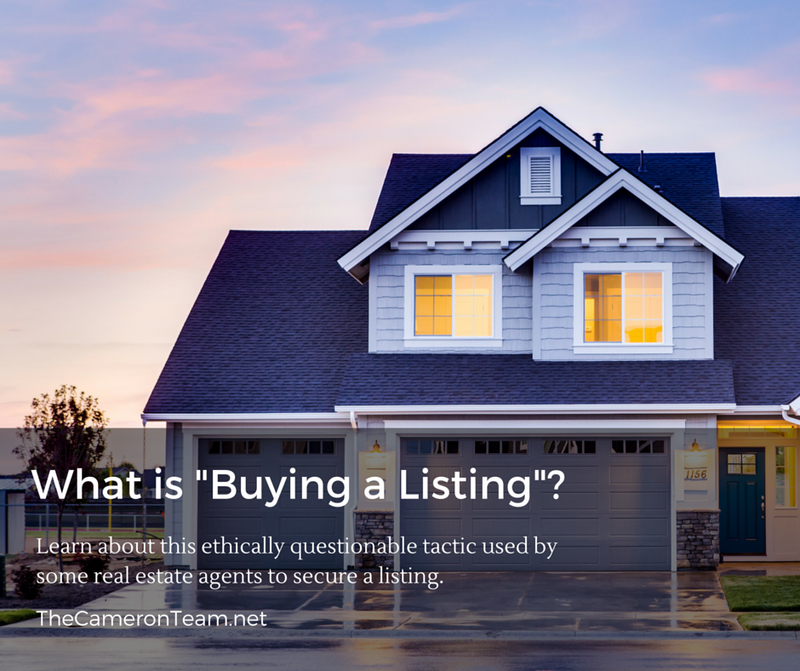 We’re speaking of the ethically questionable act of listing agents securing listing agreements by agreeing to whatever listing price the seller presents. Say you’re getting ready to list your home for sale and are interviewing agents to list the home for you. You’ve been on Zillow looking at their estimates, adding up the costs of all the updates you’ve made, analyzing your current mortgage statement, and calculating what you’ll need to purchase your next home. You now have a certain selling price that you want to get cemented in your mind. The first agent you interview takes a look around the home and shows you their listing presentation. They don’t present any recently sold homes (comparables), but they tell you they’ve sold a lot of homes in your area and are very familiar with how homes are going. They give you a listing price that tens of thousands below what you had your mind set on. You feel like you’d be giving your home away. The second agent your interview also takes a look around the home, shows you their listing presentation, and tells you that they are familiar with the neighborhood. They’ve brought print-outs of comparables, but now that they’ve seen the home, they plan on taking a closer look at the recently sold homes. When they call you the next day, they give you a listing price that’s higher than the first agent, but still not exactly where you wanted to be. You aren’t 100% pleased. The third agent you interview does much the same as the first two agents. They look at the home, give their listing presentation, and may show you some recently sold homes. Then, they ask you what price you are hoping to sell at. Amazingly, it’s quite close to what they were going to propose and they agree to list the home at the price you are wanting. I need to build up my listing inventory. This house is sellable and could bring me buyers (future clients). Once it’s on the market for 30 days, if there haven’t been any viable offers or showings, we can just lower the price. Right? I’ll just go with their preferred price, even though it will be much higher than similar homes. It’s quite possible that the third agent truly believes that your home will sell at the price you want, but it’s very important that you take a levelheaded approach to pricing your home for the market. If the agent shows you homes that are larger, more updated, and with better features, and tells you that you can list your home for the same price, take a step back and think about what might happen if you overpriced your home. First, it will sit on the market and the listing will grow cold. In real estate, time is money. The longer the home sits on the market, the more buyers and real estate agents will wonder if there’s something wrong with it and that’s a stigma you don’t want your property to gain. Then, showings will decline and later buyers will either avoid the home, assuming the seller is outright stubborn or the home is in bad shape, or try to take advantage of any desperation that may have set in from the house not selling. Finally, In an effort to appeal to buyers, you’ll end up spending more money on updates and cosmetic features than you would have if you’d just priced your home at fair market value right off the bat. That’s assuming your desire to sell remains months down the road. In the end, you are the one who decides what your home will be listed at. It’s the job of the agent to provide you the facts (similar homes sold and material fact, not hearsay), so you can make what you feel is the best decision. Just don’t ignore those facts or let your decision get clouded by emotions, or it could cost you. The third agent may be a risk you’re willing to take in pursuit of money, but keep in mind that a good real estate agent will be upfront with you on the true market value of your home. Some will be willing to work with you if you agree to be flexible. That means adjusting the listing price according to showing feedback and activity. Other agents will pass on the listing if the gap between fair market value and your listing price is too large. After all, most agents pay for the marketing of a listing well before they make any money off of it. If the home doesn’t sell, that’s money they’re out. So, they too want the home to sell. If you’re thinking of selling your Wilmington area home and want an honest opinion on its fair market value, give us a call at (910) 202-2546. We may not always tell you what you want to hear, but we’ll always be upfront about your options and mindful of your best interests, and we’ll do it with a smile!